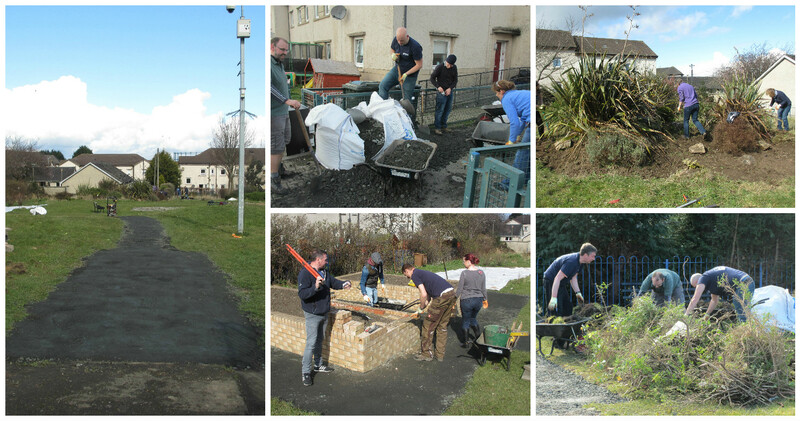 During March, Chris Peach from ‘The Conservation Volunteers’ has headed a successive team of volunteers from the Royal Bank of Scotland (RBS) to start landscaping PEP’s community garden at West Pilton Park. Over 6 sessions’ 65 RBS volunteers have started the redesign and redevelopment of the garden to make it more accessible. The volunteers have worked incredibly hard removing turf to lay a path from the garden entrance down to the vegetable plot. They also worked tirelessly on weeding the garden beds. The last group of volunteers also worked on the raised beds, removing the damaged coursing and learning to re-lay the brickwork under the watchful eye of PEP volunteer ‘Shugs’. If that wasn’t enough, the volunteers also looked at managing the sensory garden, cutting back the mature plants to allow more light into the back garden area and office itself. Their hard work has made both garden areas more accessible and enjoyable for our service users to visit and we cannot thank them enough for their amazing hard work and diligence to the tasks. We must also give a huge thank you to Chris for setting up and managing the whole process for RBS and PEP. We look forward to welcoming them back in the near future.